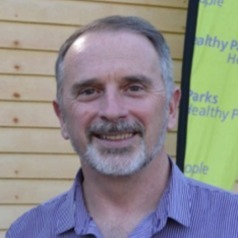 William (Bill) Jackson is an Adjunct Professor at the University of the Sunshine Coast, a director of Healthy People Healthy Parks Global, and chair of the Thin Green Line Foundation. He is also an independent environmental consultant with extensive experience in forest conservation, protected area management and community development. He held the positions of Chief Executive of Parks Victoria and Director of National Parks for the Australian State of Victoria from late 2010 until June 2015. During his time with Parks Victoria he championed the Healthy Parks Healthy people movement. Prior to his appointment to Parks Victoria, Dr Jackson was Deputy Director General of the International Union for Conservation of Nature (IUCN). He helped establish the general direction and strategy for the Union and provided top-level direction for the implementation of IUCN’s program worldwide. Dr Jackson previously held various positions in the IUCN including Director of the Global Program and Head of Forest Conservation. During his 13 years with the IUCN, Dr Jackson worked on a wide range of conservation and development issues in developing countries in Africa and Asia, including support for projects in Uganda, Tanzania, Vietnam, Indonesia and Pakistan. Prior to working with IUCN, Dr Jackson worked on community forestry in Nepal, where he assisted the Government’s Department of Forests to devise suitable and socially sustainable methods of managing community forests. His PhD focused on community management of upland and cloud forests in Nepal. Dr Jackson has co-authored numerous articles and books on community forestry, landscape management, conservation and monitoring and evaluation.